The article mentions no shoes. I would like to point out the pink valuer sweatsuit, and I'm wondering why they have handlebars NEXT TO the fly wheel. 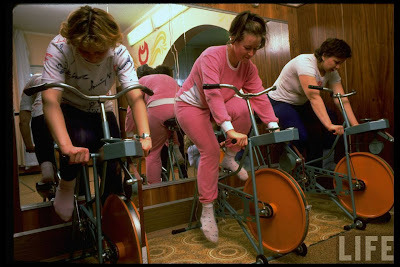 Apparently Russian women in the were forerunners in the aerodynamics revolution in cycling in the 80's... except that they're on stationary bicycles. Oh man. You can get some *serious* wind going in a cycling studio? Know how I know that? Because I have had dumbasses come into my classes wearing skinsuits. Also sunglasses, gloves, and helmets. But no aero helmets, yet.